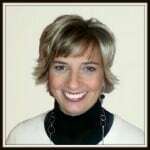 Katie’s Note: I’m so happy to have Lisa Woodruff from Organize 365 back again this week after last week’s “paper clutter reduction” post resonated with so many readers. 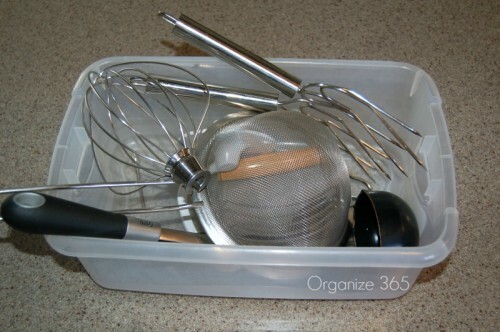 I trust her professional organizing tips can help you organize your kitchen supplies wherever you are in your real food journey. You don’t need fancy organizers, new cabinets or a professional organizer to make a big difference in your kitchen. 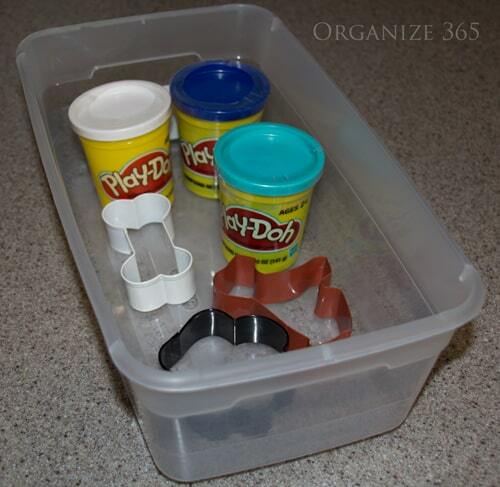 Often, simple organizers that you already have around your house will do the job just fine. 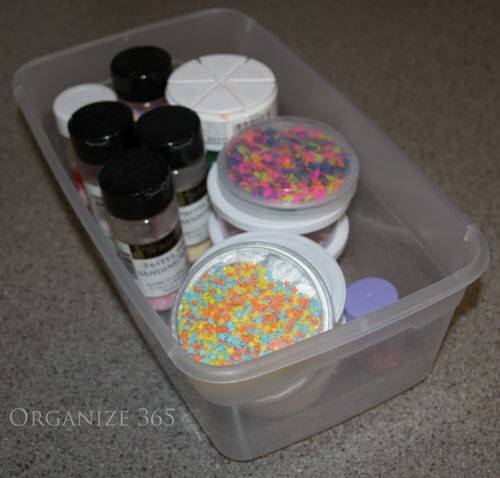 Plastic shoe boxes that you can get at dollar stores or for two dollars in any hardware store are great organizers. #1 A plastic shoe box will contain all of the various sized lids that you have for your plastic, glass or stainless steel containers. #2 Extra kitchen utensils that you use on a rare basis can be put in a plastic shoe box and stored on the top shelf in one of your cabinets. 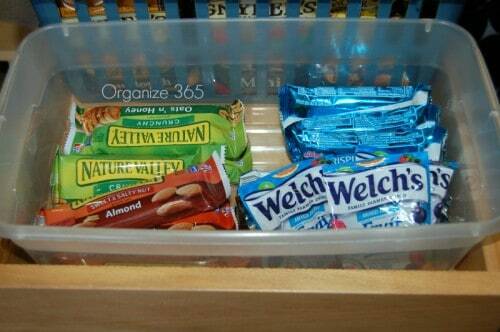 This will give you more dedicated space in your drawer for more frequently used items. The other items are still within reach, but not in the way. #3 Plastic shoe boxes are a great way to divide the drawer or shelf and corral snack size chips (or individual bags of trail mix ready to go and small containers of homemade snacks, easy to grab). #4 And cereal bars (try Healthy Snacks to Go for lots of ideas to take on the run!). 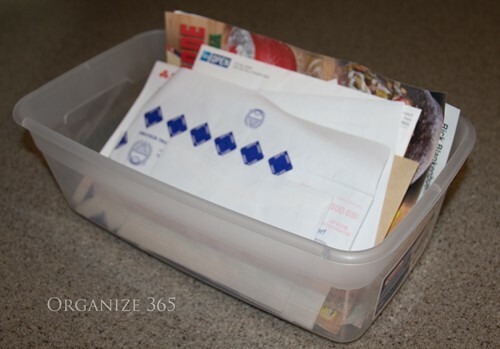 #6 Plastic shoe boxes can be used to hold your mail pile. Don’t forget my tips to organize mail and all paper clutter you might have in your kitchen. #8 Opening bulk purchases like boxes of instant oatmeal packets and putting them into a shoe box will allow those packages to take up less space. It will also give you a visual reminder of when you need to buy more oatmeal. 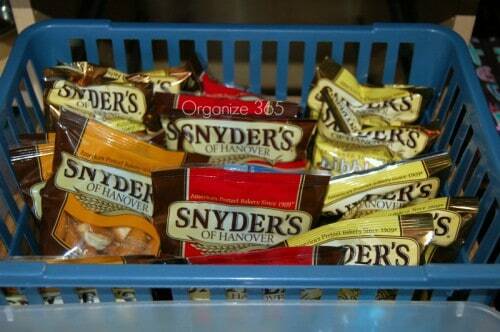 Mini boxes of raisins or other field trip treats are easy to stow away like this as well. #9 Plastic cups, water bottles, sippy cups, thermoses, stainless steel water bottles and baby bottles are easily corralled in a plastic shoe box. 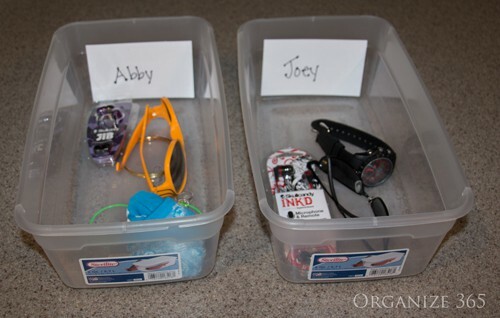 #10 I like to have a plastic shoe box with each child’s name on it in your kitchen. Then, when the area gets too cluttered, I grab the shoe boxes and divide the clutter that I see among the children that I have. Each child can then be given their shoe box and sent to put their items away. A stack of shoe boxes is also great for mom. By laying the shoe boxes out on the kitchen counter, you can divide overwhelming tasks into smaller piles. For example, if you need to make cookies for the kids’ bake sale, put everything that you bought to make the cookies in one shoe box. In the next shoe box, you might have mail. The following shoe box might have a birthday party gift, the card and the wrapping that you need to have for your child’s birthday party this weekend that they’ve been invited to. And the last shoe box might be full of mail that you need to take to the post office and copies that you need to make on your next errand day. By taking the time to break all of these activities into shoe boxes, you can grab one at a time, complete the task and put the shoe box away. I love shoe boxes because they are economical, they stack and they are easy to use! What about you? 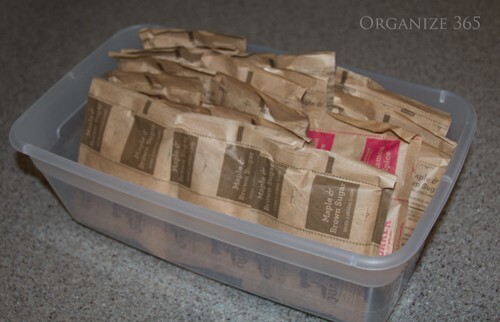 How have you used shoe boxes in your kitchen organizing…or anywhere else? 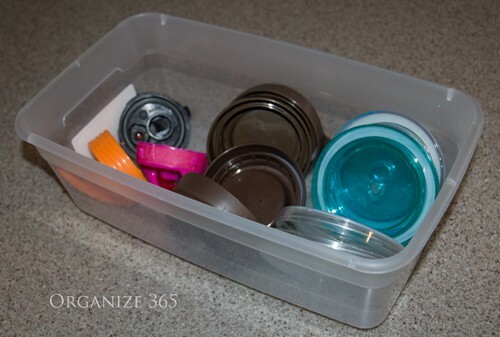 Or what other containers around your house can you imagine would straighten out a messy cupboard or drawer? From Katie – My favorite tip was number two by far – sometimes the simplest ideas feel like a REVELATION, don’t they? What’s your favorite? Disclosure: There are affiliate links in this post to Life Without Plastic from which I will earn some commission if you make a purchase. See my full disclosure statement here. I am an organizer: it’s what I do 🙂 I recently cleaned out and organized my mother-in-love’s kitchen cupboards. I love using boxes to store like items for higher cabinets. For instance, all of her dehydrated foods were in ziplock bags, so I put them all into a single box and on the top shelf. It’s lightweight enough to not hurt her pulling it down or putting away, and she doesn’t have runaway bags cluttering the shelves and getting lost. I don’t know what others do who take an assortment of vitamins, supplements, and herbs, but I have a lot of very small baggies, like 2″x 2″. I lay them out on the table, maybe 3-4 weeks worth at a time, then go through my bottles laying them out on top of the bags. Then I fill each bag and they go into a pretty bowl or box, wherever you’ll remember to see them. Right on the table works best for me, so we can see them when we sit down to eat. If you have more than one family member using these, with different contents, just use a Sharpie or nail polish to identify them. Great tips!! Thank you. I too LOVE number 2, and also number 9. As far as what I do, I organized our pantry (finally!) with those cloth closet cubes (ClosetMaid or other brands) and big manila shipping tags tied to the handle of each and labeled with what is in each. For an example, one cube’s label said “Tomatoes, sauce, beans, broth” and in it I stored canned beans, canned diced tomatoes, jarred pasta sauce, chicken and vegetable broth. In another, I kept all my dried pasta and rice. It really helped make better use of the space in a very shallow pantry with wire shelves that are sometimes tricky to store things on. It also made putting pantry items away very easy. And it looked really nice, too! PS– I put this in the past tense b/c we just sold our house. I think the pantry was one of the easiest spaces to “stage” since it was pretty much already staged from this process! I have wire shelves too, and am constantly knocking over smaller things like soy sauce that don’t stand up well on the wires. I like your idea & might have to keep my eyes open for shoe boxes or cloth cubes. Yes, agreed! I was always knocking stuff over too. And this also makes it easier to find things, since you just pull the box / cube out a little and tip it to find things, rather than having to move things out of the way first (knocking over even more in the process if you are clumsy like me! ).